Citizens of the world, how can we help? Two days ago, I got to be part of an amazing experience: my wonderful, beautiful sister-in-law’s Naturalization Oath Ceremony. Being a natural-born US Citizen, I’d never been to a Naturalization ceremony before. I had no idea what it would involve, or how moved I would be by the process. 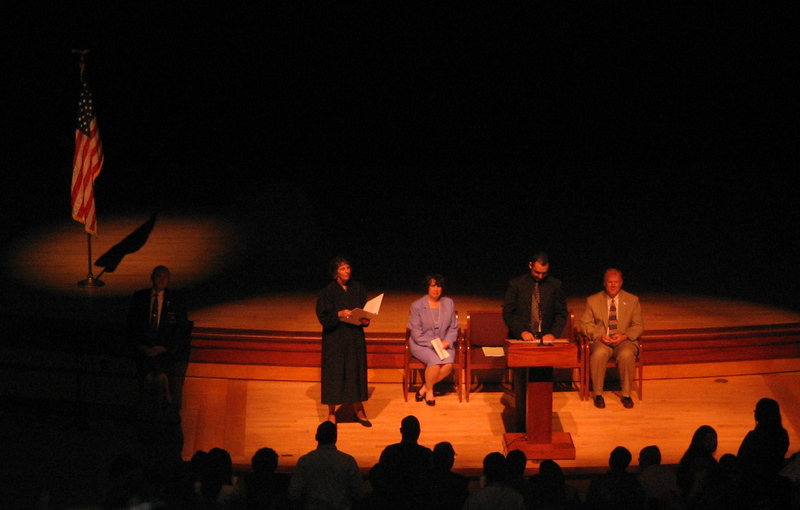 Over 700 people from 82 countries took the oath that morning. I teared up as a woman from Washington D.C. (I wasn’t paying enough attention at this point to remember her name) told her family’s immigrant story; again as they read through the names of all 82 countries represented and finally got to Kenya; and again as (I know) “Proud to Be an American” (I KNOW) played over scenes of immigrant arrivals and ceremonies through the years. Being a genealogy geek, I couldn’t help but think of my own family’s story. I’m a mutt derived mainly from Scandinavians, Acadians and (of course) the Irish. Where else could this mix exist but here? Some of my ancestors crossed the Atlantic in the mid-1600s; some didn’t make it here until the early 1900s, including my Irish grandfather in 1914. What brought them here but a search for a better life? Were they forced to look elsewhere due to poverty or famine? 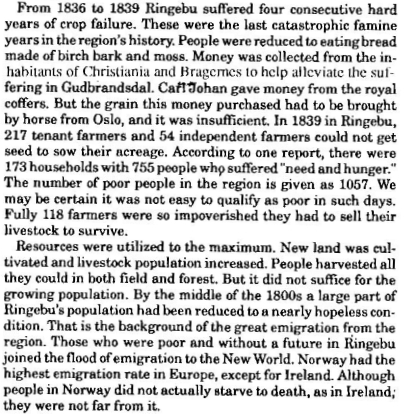 An excerpt on famine from "Emigration to America from Ringebu, Norway," where I have roots. I told you I'm a genealogy geek. I don’t know the stories of the 700 people who took the oath on Wednesday, but I do know famines are still a factor in the world: there’s a horrific drought and famine in east Africa right now. The images are disturbing, the fact are frightening, and all I can do is keep looking for ways to help from my very privileged life. I’ve added a link to the World Food Programme in the right sidebar of this blog. I’m volunteering with Feed My Starving Children next week. Doctors without Borders and the American Refugee Committee are also good places to donate. I’m open to other suggestions. I’m sure my ancestors came here looking to provide a better life for their descendents, and I am positive they found it. And the same will hopefully be true for those 700 new Americans — and all of the people who need our help worldwide. We are so privileged, living here — and we can help make the world a better place. Rae, I’m glad that you and your mum were able to experience the Naturalization Oath ceremony with me. I’m not surprised that you are volunteering your time with Feed my Starving Children, your kind heart will take you a long way. I enjoy reading your blog and I’m so proud to be your sister-in-law.